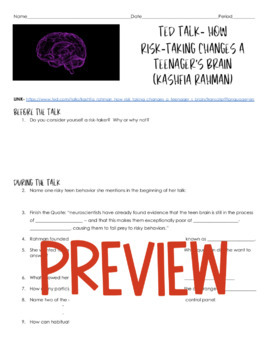 Kashfia Rahman's TED Talk, How Risk-Taking Changes a Teenager's Brain, focuses on her research that she completed while in high school. 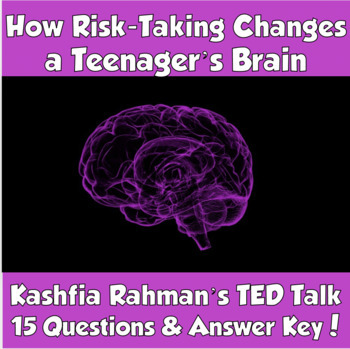 She examines how teenagers can be very bright but make some risky or dangerous choices. She knew teenager's brains were not fully developed, but believed there was more that just lack of brain maturation that led to these risky choices. Her work looks at how habituation to fear and guilt can also play a dangerous role in these negative risk choices. This would be a great lesson for Psychology’s Brain Unit, Health class, or an Anatomy/Biology course. 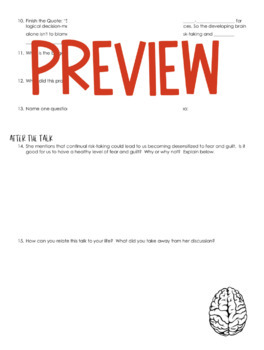 My worksheet contains 15 questions and an answer key has been provided for your convenience. The talk is just shy of 12 minutes but you will need to allow additional time since there is a question to answer before the talk and two questions to answer after the talk. You may also want to allow for debrief time as well.